We know that the early Earth was a violent place, but just how violent? The so-called Late Heavy Bombardment is thought to have occurred from 4.1 billion to 3.8 billion years ago, likely the result of asteroids being destabilized in their orbits by shifts in the orbits of the outer planets. That model is self-limiting, with the unstable asteroids being depleted over time and the Late Heavy Bombardment winding down, and it matches the dating of rocks from the lunar basins that show vivid evidence of the battering both Earth and Moon took. The main asteroid belt’s inner boundary is currently set by the v6 secular resonance at 2.1AU (one astronomical unit is approximately the Earth–Sun distance); objects entering this resonance have their eccentricities pumped up to planet-crossing values in less than a million years. Before the LHB, the giant planets and their associated secular resonances were in different locations, with the only remaining natural inner boundary being the Mars-crossing zone. Accordingly, the main asteroid belt may have once stretched into the E-belt zone as far as 1.7AU. Destabilizing the E-belt asteroids, then, caused nearly all of them to be driven onto planet-crossing orbits over the next four billion years, with a small percentage of survivors winding up in the ‘Hungaria’ population of high-inclination asteroids. The record of major impacts is preserved in the melted droplets of debris called ‘impact spherules,’ which would have been scattered around the planet in the case of major events like the one causing the Chicxulub crater in Mexico, thought to have occurred 65 million years ago and potentially the event that caused the demise of the dinosaurs. You’ll recall it was Chicxulub that Tetsuya Hara (Kyoto Sangyo University) and colleagues used in their study of impact debris, as discussed here on Friday. Image: Researchers are learning details about asteroid impacts going back to the Earth’s early history by using a new method for extracting precise information from tiny “spherules” embedded in layers of rock. The spherules were created when asteroids crashed into Earth, vaporizing rock that expanded as a giant vapor plume. Small droplets of molten rock in the plume condensed and solidified, falling back to the surface as a thin layer. 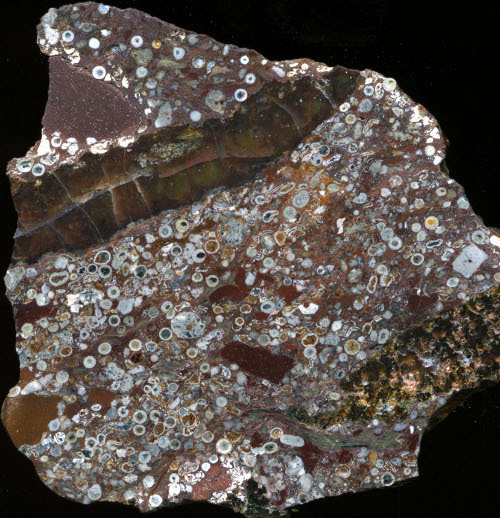 This sample was found in Western Australia and formed 2.63 billion years ago in the aftermath of a large impact. Credit: Oberlin College/Bruce M. Simonson. A period of bombardment emerges from the study of spherules that continued long past the time older theories assumed it had ended, making impact events a continuing player in the evolution of life. Brandon Johnson and Jay Melosh (Purdue University) add to this picture in the same issue of Nature by looking at similar spherules in rock formed between 2 billion and 3.5 billion years ago, finding evidence that the theory of an extended Late Heavy Bombardment makes sense. Johnson told Nature’s Helen Thompson in a review of his work that it “… shows that a lot more big asteroids — meaning dinosaur-killer or larger — were hitting Earth well after the current idea of when it ended.” The paper supports Bottke’s analysis, with impacts continuing to be prolific in the Archaean eon, when photosynthesizing cyanobacteria were on the rise. How life would have responded to a sustained barrage throughout this period is unclear. A giant impact would have come as a severe blow for some forms of early life, but it need not have been all bad news, says Steve Mojzsis, a geologist at the University of Colorado Boulder. That is because the energy deposited by the ongoing impacts could have created hot zones like those found near hydrothermal vents today. “These are great places for microbes,” says Mojzsis, who notes that some phylogenetic evidence suggests that the last common ancestors of all present-day life were heat-loving organisms. The papers are Bottke et al., “An Archaean heavy bombardment from a destabilized extension of the asteroid belt,” Nature 485 (03 May 2012), 78–81 (abstract) and Johnson and Melosh, “Impact spherules as a record of an ancient heavy bombardment of Earth,” Nature 485 (03 May 2012), 75-77 (abstract). Be aware, too, of the Impact Earth! calculator, available online from Purdue to allow calculations of asteroid or comet impact damage based on the object’s mass. The new work should allow its engine to be fine-tuned. The oceans would have remained a reservoir of life that would survive each impact, even if the land surface was sterilized. However we know microbial life can be found kilometers down in the rocks, so even this reservoir would have been untouched. What is interesting is that the origin of eukaryotes is estimated to be around 2 bya, which might be just at the end of the last bombardment. Implications here for the idea that multicellularity is a particularly difficult evolutionary step that takes a long time to happen. Maybe that’s not true at all – maybe multicellular (or at least, eukaryotic) organisms appeared on Earth as soon as the conditions were right. My home school student has been studying biology and happened to be working on origins of life, so the info on eukaryotes is very timely. In systems without massive planets, especially Jovian mass, I wonder what the overall rate of impacts would be on the terrestrial worlds. Whether those inner rocky worlds would still get their water even if there weren’t any massive planets nudging comets inward. You have to wonder if having Jovian planets in the outer system is such an advantage after all. Perhaps any life that arose on a planet in systems without their version of a Late Heavy ( Extended or Not) Bombardment would have evolved much more quickly without being reset by near or sometimes even completley sterilizing huge impacts. Still something may have to bring the water unless they can get all they need shortly after the initial formation has ended? As previously noted by earlier posts it is very suggestive that more complex life developed on Earth at about the same time that massive impacts stopped hammering the early biosphere. If this idea about an extended not so late Heavy Bombardment is accurate it provides a good explanation for the lag between the emergence of life on Earth shortly after it cooled and the much later appearance of multicellular organisms that may have required a more stable enviroment to survive. I wonder how many times some kind of complex life emerged during this period only to be eridicated by some gigaton event that some of the simpler more robust single cell organisms were able to ride out. Perhaps Jupiter hasn’t been such a big help after all? It is not true. We know of (as I recall) 14 independently evolved instances of multicellularity, and likely there were a lot more we do not know about. I have read this very late because I have been on holiday. This is decidedly not an extension to the late heavy bombardment. Many LHB impacts would have been sufficient to vaporise all Earths oceans – allowing only an endolithic refuge for life not an oceanic one. Still dramatic though! The region beneath Earth’s surface may be crawling with diverse organisms, and now researchers reveal the lives of just one group of bizarre beasties: methane-spewing microbes that hide out in the cracks of hot undersea volcanoes. Called high-temperature methanogens, these microbes rely on the hydrogen and carbon dioxide in their superheated deep-sea vents for growth, excreting waste products like methane. The possibility of past or present life on other worlds such as Mars, where the rover Curiosity has just set out to investigate whether the environment was ever fit for microbes, will become clearer by figuring out the extreme limits (or minimum requirements) for some organisms on Earth. Previous post: Impacts Spreading Life through the Cosmos?